The Ceremonies Team is the team of Arrowmen who run the ceremonies the Lodge puts on. They are the ones who both plan and run the ceremonies such as the Ordeal Initiation and the Brotherhood Ceremony. Our Ceremonies Team is a place that nurtures public speaking and body language skills, theatrical performance skills, and operational management skills. We provide regular feedback on these skills, and offer ways to improve yourself in these skills. Our Committee also offers the opportunity to compare your skills to those across the country in Sectional and National ceremony competitions. In our team we can fill in the blanks about how the Order began and why it is what it is today. Our ceremonies provide knowledge about the origin story of the Order as well as its principles. Our Team is a place to make friends of similar interests, and grow and develop with them as a team. 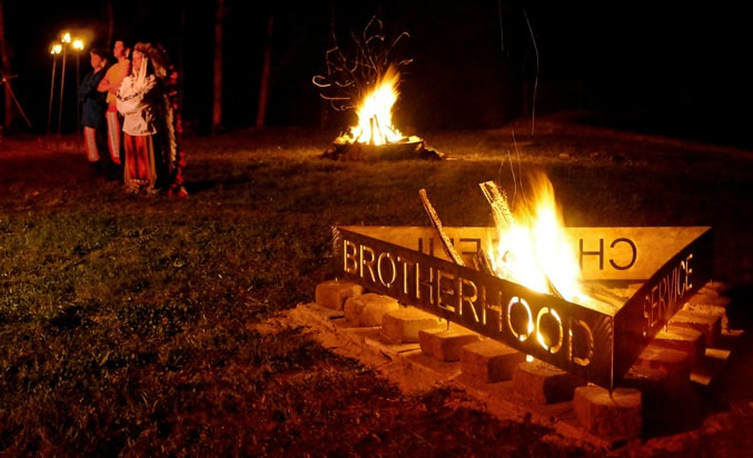 Through our ceremonies you can grow as Brothers in our Order and in life. We hope to see you in the ring. The Ceremonies Team is always looking for new member to join the Ceremony Team as we have several Ceremonies for the youth Arrowmen to take a point in throughout the year, Waguli Lodge's Ceremony Team is not only involved in doing the Ceremonies for our Lodge at Summer Camp Tap-out, Ordeal and Brotherhood for our Lodge, but the Ceremony Team has a competitive side as well. Waguli's Ceremony Team also goes to SR-9 Heartland Gathering and join in on the Ceremonies Competition with the other Lodges in our Section. As Ceremony Team Adviser it is one of my goals to help teach every young men that wants to take part in the Ceremonies Team the Traditions and Ideas of each Ceremony our Lodge takes part in. Also as one of my Ceremony goals I would like to see Waguli have more then just one(1) Ceremony Team to preform the several Ceremonies we do throughout the year. Waguli Lodge has a long standing Tradition in the Tap-out Ceremony and area in which the Ceremony is preform at CSD in the Newly reopened Founders Ceremonial Ring. I urge Every Arrowmen who has an interests in Ceremonies to come to one of our Team Practices, you can contact me to find out when and where the Ceremonies Team is Practicing. Waguli Lodge 318 Ceremony Team is glad to able to offer to the Units of the NWGA Council an Arrow of Light Crossover. Waguli you has two(2) different AOL Ceremonies that we can offer Units. One of the Ceremonies is gear more to a weekend setting and the other Ceremony is gear more for a Weekly Meeting night Crossover. The Ceremony Team will only needs about 3 week notice to schedule your Units AOL Crossover. The two(2) Ceremonies the Lodge is offering are below for your Unit to look over, once we have looked over the Ceremony you would like please fill free to fill out the Email and Schedule with everything that the Lodge Ceremony Team will need to know about your AOL: Crossover.